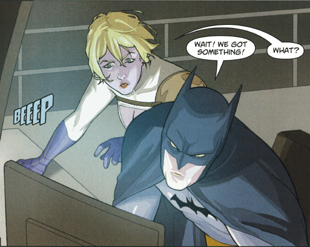 This is another fantastic Power Girl moment. I remember my first time reading this, I so identified with Power Girl. 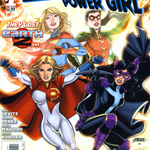 As many of you may know, the history of Power Girl has been convoluted throughout her many tales. This particular instance of telling occurs at the very end of four issues of her trying to figure out who she really is, what her history really is, is she really from Krypton, etc. At the very end, she flies down to JSA headquarters, and she’s still frustrated — and even questions whether she should even exist. Ma Hunkel says, “But they can handle that. What’s wrong with you?” Her answer, “Nothing. Just another day in my perfect life,” reminded me sooooo much of myself. Most of the time I actually feel the same way, like I really don’t feel like sharing with people how I’m really feeling. How I’m doing inside is not so as important as that I come across as strong and sure, so no matter what I’m feeling like inside I say, “I’m the wellest” and move on without wanting to bring others around me down. I lie and say I’m feeling good about it. But even as a member of the J.S.A. with friends that have become like family, I still feel, in the pit of my stomach -- alone. Completely and utterly alone. I tell myself that I’m okay with that. Maybe one day, I actually will be. For myself, I feel that a great lot of the time too, that I’m so alone, without a history or a family and that one day, maybe, like Power Girl, if I just say it enough, “I actually will be.” Brilliant writing by Jeoff Johns. 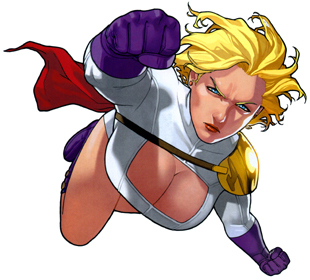 I love Power Girl!!!! It is an interesting phenomenon to note that many a comic book hero is an orphan! They are alone in a great many respects. I suppose though that the superheros themselves can take some comfort in there being other heros with them, the J.S.A., etc. being Power Girl’s new family. Great stuff. This particular great Power Girl moment is from JSA Classified #4, or the trade paperback “Power Girl,” by Geoff Johns, Paul Levitz, Paul Kupperberg. 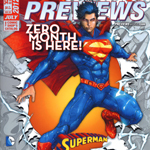 To pick up an individual issue or the trade paperback for yourself at your local comics shop and support local business in your area, find a local comics shop at: www.comicshoplocator.com. 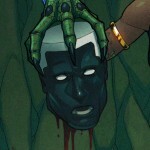 Or pick up #4 through www.amazon.com, in trade paperback, or through another online retailer. 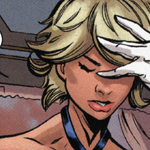 2 Responses to "Great Power Girl Moments #7 — JSA Classified #4, p.18"
Thanks. I love Power Girl.